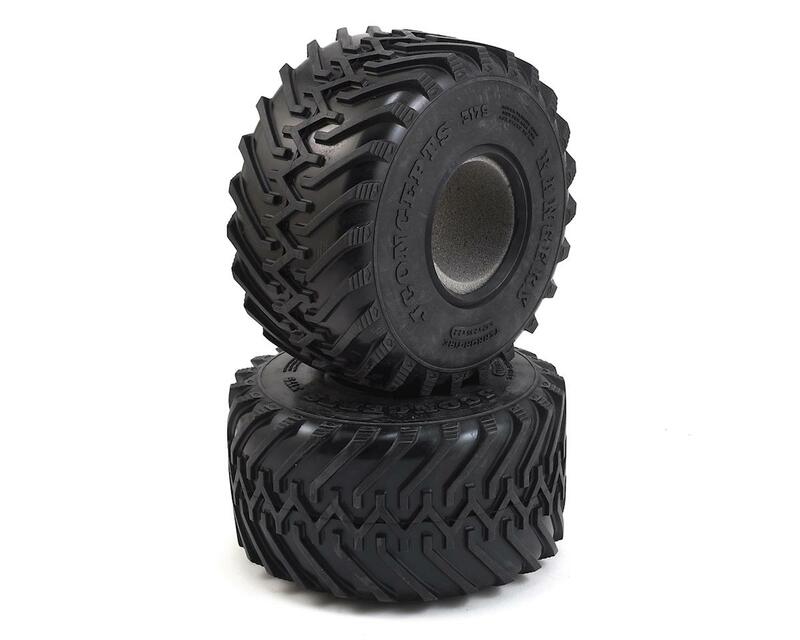 JConcepts Rangers 2.2" Monster Truck Tires are a replica of the legendary 48” tire that helped to spawn the monster truck craze in the late 70's. The “48’s” as a lot of enthusiasts called them, were special and featured a Zig / Zag tread pattern, deep cleats, and the large overall diameter. The size of the tire, made crushing cars possible and they even made their way into a Hollywood feature film. In the RC world, the “48’s” have never been available, until now. 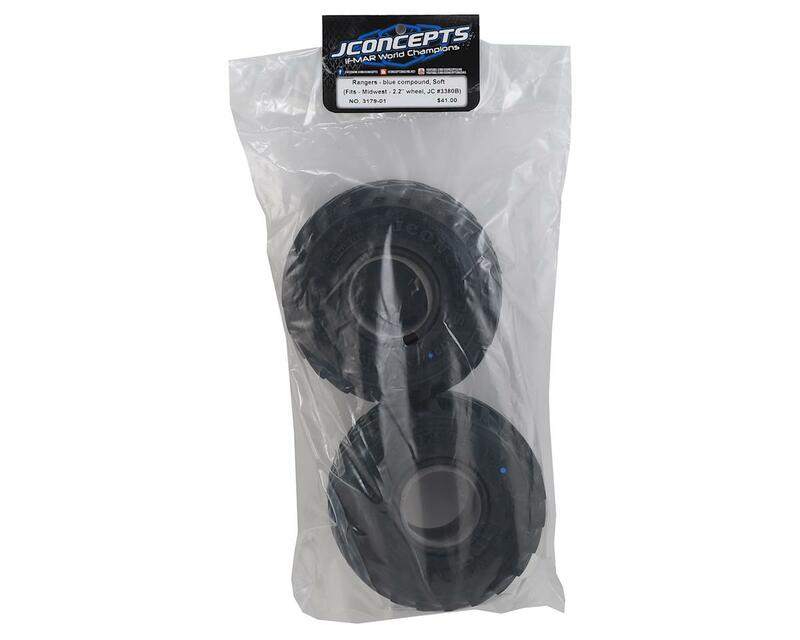 JConcepts had multiple goals in mind while designing the Rangers tire. First, in RC, the 2.2” wheel is perhaps the most popular wheel in the industry and using that as a base point, the Rangers tire started to take shape. The popular wheel size also fits around the suspension geometry on a vast assortment of trucks, making it very versatile. Second, there is already a 2.2” class in RC Monster Truck racing so the Rangers drop perfectly into that segment with no need for adjustments or changes to the rules. To build a great looking retro tire, the Rangers needed to look the part and thanks to the Zig / Zag tread, scale depth and side-wall lettering, the tire has an unmistakable look. The included open cell “React” inserts fill the void inside and help stabilize the large contact patch of the famous looking tires. The low-profile stance stays very flat during race course competition, speed-runs or general use. The tire carcass profile holds the weight extremely low while the design of the tire beads allow just the right amount of contact patch for gluing and application. The Rangers measure in at 5.57 x 2.95 x 2.2” and are available in two different compounds. The tires are built to fit the JCO3380 Midwest 2.2” wheel (available separately) which bring scale and authenticity to the next level. The soft "blue" compound which is recommended for dirt, grass and asphalt feels noticeably mushy and sticky and has expanding characteristics similar to off-road racing outdoor compounds. The "gold" compound feels harder to the touch and excels on carpet, AstroTurf and polished concrete surfaces and expands less during high-speeds. The Rangers tires are already a winner, taking the High Voltage RC 4-Link Nationals in a sweep with an amazing debut performance in the hands of Russ Bryant (1st place), Sonny Santucci (2nd place) and Matt Stoltz (3rd place). When the monster calls, answer with JConcepts - World Proven Innovation and Design.